Nikki lost her mother but then she found love with Jack and despite some insecurities, they’re happy. One night, she meets Cole and they become friends. Nikki finds out that her mother’s killer is going free and loses it. She goes to find Jack who’s at football camp and finds his ex coming out of his room. She runs to Cole and asks him to take her pain away. Cole takes her to Everneath and now that she’s back on the Surface, she wants to say goodbye. Cole wants her to become an Everliving because she survived the Feed. Nikki refuses and tells Jack everything. Eventually, they decide to kill Cole and miss. The Tunnels come for Nikki but Jack willingly goes in place of Nikki who vows to find him. More than a year ago, Nikki’s mother was killed by a drunk driver. Nikki was having a hard time dealing with her loss. However, things got better when Jack (her longtime crush and the high school quarterback) and her started dating. The only thorn in their relationship? Jack’s ex, Lacey Greene, who wanted Jack back. Still, they were happy and in love so it didn’t matter much. Then Nikki meets Cole at a club and they become friends. Cole has set his sights in Nikki to be his next Forfeit so he manipulates Nikki’s emotions towards Jack to create problems in their relationship. Just when her mother’s trial is coming to an end, Jack leaves for football camp for two weeks. Cheerleaders were also going which means that Lacey was going. To distract herself, Nikki and her BFF, Jules, go to Cole’s band concert. Even though Jack is not allowed any contact with the outside world, Nikki feels as if Cole is hiding something from her about camp as Cole’s friend’s girlfriend, Meredith, is also at camp. The next afternoon, Cole and his bad invite Nikki to go river rafting with them. On the raft, things go horribly wrong and Nikki’s leg is badly hurt. She just wants the pain to go away and Cole obliges. That day, the man responsible for her mother’s death goes off scot free. Nikki’s father who’s also the mayor forgives him. But Nikki is devastated and runs to Jack at his football camp. There, she finds Lacey tiptoeing out of Jack’s room. She runs right back out, Jack tries to stop her from his window but all Nikki knows is that Cole can take her pain away. At his condo, Cole tells her that there’s no going back from this. Nikki goes ahead with it despite feeling a little bit apprehensive. After that, Cole feeds on any doubts Nikki gets about her decision. A few days passe and they eventually go under. To Everneath. The Feed is finally over and all Nikki remembers of her past life is a face. Jack’s face. Now she has a choice: to go back to the Surface for six months before the Tunnels come for her or stay with Cole to become an Everliving. Nikki chooses to go back. At the Surface, things are distant with Jack and Jules. Her father has set certain expectations from her, like doing community service at a soup kitchen. At the soup kitchen, someone named Mary keeps coming back and saying something odd every time. At school, Jack is slowly warming up to her. Things get better and Jack suggests getting back together. Nikki refuses because what’s the point of leaving him again. Meanwhile, Cole keeps persuading her; showing her the Tunnels, warning her about the Shade that is inside her, taking her to Everneath’s heaven, the Elysian Fields. Eventually, he just arrives at her school with a changed appearance. Remember that Cole is doing all this because he wants to overthrow the queen of Everneath and he needs Nikki to do that. But there’s a catch: as an Everliving, Nikki would have to feed off on other humans which she refuses to do. There’s something fishy going on with Cole; Nikki spots him talking to someone about keeping the queen high with food (re: human emotions) so that she doesn’t notice Nikki. There are mentions of Meredith. Nikki finds Jack and Cole (re: Neal) fighting over her at school. She tries to break it up but things go out of hand. There’s a car chase. Jack is badly hurt and clings to Nikki but then she sees that Jules in pain. Nikki leaves them alone. In the Shop-N-Go (AKA the point of entrance to Everneath), Nikki gets to know that humans cannot go to Everneath without an Everliving host like a strand of their hair. Nikki and Jack share a moment where Nikki admits she remembers Jack and their relationship. Cole tells Nikki to be at the Christmas Dance as he wants to show her something. So she goes there alone. Cole does some weird stuff when he’s up on the stage, singing. The emotions in the room gets dark, everyone starts fighting and leaves. Cole calls it a cracked heart. Slowly Nikki tells Jack everything except how she’ll be going back to the Tunnels forever. They try to solve the mystery of Mary and find out that Mary is actually Meredith. She’s also a Daughter of Persephone raised to be a Forfeit but, like other daughters, she couldn’t survive the Feed and remain young. The story of Orpheus and Eurydice is directly linked to Nikki and Jack. Jack is Nikki’s anchor which is why she is still whole after the Feed and why Cole is after her. Cole tells the truth about the mark to Jack. Jack is hurt but hasn’t given up and manages to find Mary. She gives Nikki a bracelet that belongs to the Daughters of Persephone and tells her it doesn’t matter who pays the debt, the Tunnels just want someone to fill it. Jack and Nikki witness Mary being taken away by the Tunnels. It’s chilling. They clean the bracelet and find hieroglyphics drawn on it. They refer to the fact that the human soul is made up of five parts: the name, the personality, the life force, the shadow, and the heart. The bracelet also refers to an ancient civilization called the Ring of the Dead also known as the Akh ghosts. Akh ghosts (re: Everlivings) are humans who have discovered the key to eternal life by giving up their own life forces, and stealing them from others. The only way to kill an Akh ghost or an Everliving is to kill its heart which is outside their body. So all Nikki and Jack have to do is figure out where’s Cole’s heart is and kill it. On the day when Nikki’s time is over on the Surface, she goes to Cole and agrees to leave with him. While she distracts him, Will, Jack’s brother, smashes his guitar thinking that it’s his heart. But Cole’s heart is actually his guitar pick. The Tunnels finally come for her but Jack throws her away from them and sacrifices himself to the Tunnels. Nikki goes in a shock. Cole is still on the Surface and it doesn’t look like he’s ever giving up. Every night, despite being a world away, Jack is with Nikki. Every night, they lie in bed together but are like ghosts to each other. Nikki tells him to hang on and vows to find him. One hundred Everneath years equals six months on Earth. Elysian Fields – An Everliving heaven of light, happiness, immortality, and where all the good emotions are expressed outwardly in the surroundings. Everlivings – Beings who have discovered the secret to eternal life. 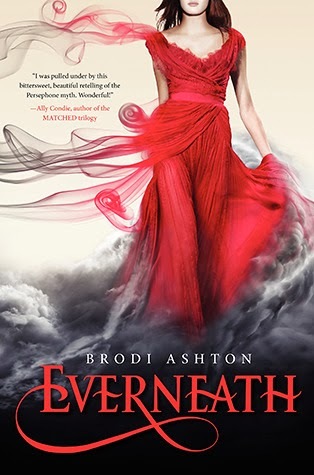 Everneath – A place in between Earth and hell for the Everliving and the Forfeits. Forfeits – Humans who give up their lives on Earth to nourish the Everlivings. Feed – An Everliving act of feeding on emotional energy of Forfeits for an Everneath century to extend their immortal life by a hundred years. Return – A temporary Return to the Surface before the Forfeit is sent to the Tunnels forever. River Styx – The layer between Everneath and the Surface. Shades – Shadows that funnel energy from humans into the Everlivings. Tunnels – A long dark tunnel with walls of coal where humans go to become batteries to power the court of Everneath with their emotional energy.